The Redbone coonhound is a mild-mannered yet energetic hound dog of medium to large size with a friendly and loyal disposition. Easily recognized for their brilliant red color, these hard-working hounds are well-suited to both hunting and companionship. 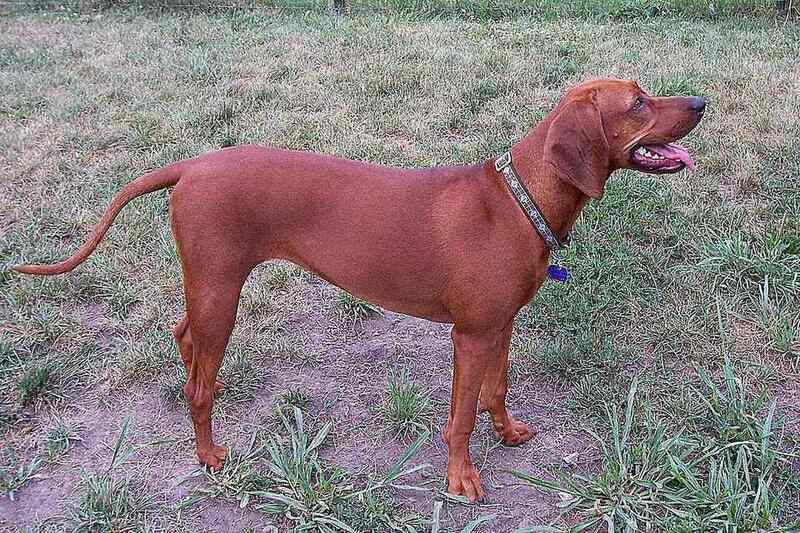 Redbone coonhounds can be great family dogs when properly trained and socialized. Redbones are also known for their voices—like most hounds, they bay. Some find the Redbone's bay rather sweet and song-like, while others can be quite annoyed by it. Redbone coonhounds originated from red foxhounds brought to the U.S. by Scottish immigrants in the late 18th century. While you might think their name comes from their color, it derives from the name of an early breeder, Peter Redbone. The majority of the breed's development took place in the Southeast, especially in the state of Georgia. Over time, the foxhounds were bred for raccoon-hunting traits and were eventually crossed with Irish hounds and possibly bloodhounds at some point. Later, breeding was selected for the notable red color. By the end of the 19th century, the Redbone coonhound was a well-established breed. Over the years, Redbones have continued to act as excellent hunters and remarkable companions. The Redbone coonhound was officially accepted into the AKC hound group in 2009. They are still rare outside of North America. They are featured in the book and movie, "Where the Red Fern Grows" and the movie, "The Outlaw Josey Wales." Redbone coonhounds have short, smooth coats with a fairly low rate of shedding. Routine basic grooming with weekly brushing is all that is typically necessary to keep Redbones looking their best. They tend to have a distinctive hound odor, which you can keep at bay by bathing. Like all dogs with long floppy ears, it is important to keep the ears clean and dry to prevent infection. Trim your dog's nails to prevent splitting and tears. Brush your dog's teeth a couple of times each week at a minimum for good dental hygiene and to help prevent gum infections. Redbones are intelligent dogs, but they can also have a stubborn streak. Proper training is an absolute necessity and will help strengthen the bond between you and your dog. They are easily trained for hunting duties but other mundane commands don't come as naturally. They need lots of patience and persistence when being trained as they are said to be prone to "canine attention deficit disorder." As hounds, they are also known to creatively interpret your commands rather than follow them in the way you intended. This may not be the best breed for a novice owner to train as a companion pet rather than a hunting dog. ​Socialization is equally important. They are generally friendly to everyone, which makes them poor guard dogs but good companions. As they are still true to their hunting dog roots, they are usually not excessively clingy with their owners. This breed has loads of energy and can easily become bored, so adequate exercise is essential. As much as 90 minutes per day is recommended by some experts. They are excellent swimmers, so this is another option for exercise. Redbones should be kept on a leash or in a fenced-in area and not permitted to roam free. Once they catch a scent, they will follow it. With a strong desire to hunt, this hound can get pretty far very fast. Taking your dog for a long walk with lots of opportunities to sniff can keep him happy and stimulated. Redbones tend to get along very well with children and other dogs. They might play too energetically for a toddler but playing with older children can keep the dog and the kids entertained. It may be hard for a younger child to control this dog on a leash when the dog catches the scent of potential prey. Redbones have a very high prey drive and are hard-wired to chase raccoons and other small animals. Extra care should be taken to socialize your dog to cats and other small animals. If the two are to share a household, the Redbone should ideally be raised from puppyhood with the cat. They are said to do better with cats than is seen with other coonhounds. If you are adopting a Redbone coonhound, be aware that their bay can be a problem in an apartment, urban, or suburban setting. Luckily, they are not as vocal as other hounds when they are not on the hunt. A Redbone coonhound will need about 2.5 cups of dry dog food per day. It's best to give two smaller meals per day rather than one large meal or allowing free feeding. They are known to be enthusiastic eaters and are prone to overeating. If you think the Redbone coonhound is the right dog breed for you, be sure to do plenty of research before adopting one. Talk to other Redbone owners, reputable breeders, and hound rescue groups to learn more. Otherwise, explore our wide variety of dog breed profiles. With a little research, you can find the right one to bring home.